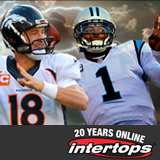 A lot of NFL football fans were happy to see the Denver Broncos and Carolina Panthers win their conference champtionships last week but three Intertops Sportsbook customers are happier than most. Their correct predictions on the Intertops Facebook page won them each a $50 free bet! The full-featured online sportsbook offers competitive NFL betting odds on dozens of wagering options on Super Bowl 50 (https://sports.intertops.eu/en/Bets/Sport/1). Intertops Sportsbook, the world’s first online sportsbook, recently had a complete mobile-friendly redesign and now has more wagers and attractive new parlay options that ever before.